Assumption Abbey fruit cakes are a dark, rich traditional style fruit cake, made by Trappist monks in a small monastery in Ava, Missouri, who oversee all stages of production. This rich, dark and spicy fruit cake is spiked with burgundy wine and rum, and studded with English walnuts, pecans, pineapple, cherries, raisins, currants, South American citron, and orange and lemon peel as well. This fruit cake is one of our favorites. A perfect balance between cake, nuts, fruit and rum - not too much of any one thing. This two pound fruit cake serves 7-8. You can use our fruit cakes as Christmas fruit cakes as well! About the Abbey Assumption Abbey is a secluded Trappist monastery nestled in the foothills of the Missouri Ozarks. It was established in 1950 by a group of monks from New Melleray Abbey in Dubuque, Iowa. Through the years, the brothers of Assumption Abbey have been known for the dedicated lives they lead and their traditional hospitality. Trappist Monks are members of the Cistercian Order which was founded in France in the eleventh century at the Monastery of Citeaux, from which the Order takes its name. The name Trappist comes from the Monastery of LaTrappe which played a prominent role in a later reform within the Order. Assumption Abbey is one of the seventeen Trappist monasteries in the US, many of whom support themselves through the production and sales of specialized food items, and all of whom continue to live by the centuries old Trappist tradition of contemplation and study, common worship, and living by the work of their own hands. About Fruitcakes When Assumption Abbey was first developing its bakery, the monks sought the help of world class chef Jean-Pierre Auge, who at one time served in the royal employ of the Duke and Duchess of Windsor. Mr. Auge's assistance and his generosity in providing the recipe and ideas for production gave the monks the impetus to go forward with the Assumption Abbey fruit cakes. Assumption Abbey fruit cakes are the dark, rich, traditional style of fruit cake. They are baked slowly and aged under the careful supervision of the monks. Everything, from marinating the fruit, to mixing, to baking, to packaging, to aging, to mailing is done right at the monastery by the monks. Assumption Abbey is not a commercial enterprise. It is a way of life, and that way of life, combined with the careful work of the bakers, insures a dedication to high quality that make Assumption Abbey fruit cakes among the country's finest. This classic fruit cake makes a great gift; the cake is presented in a tasteful white tin with a picture of the Trappist Monks on the label. Assumption Abbey fruit cakes are among this country's finest. Celebrating 24 years of prayerful baking in 2012! Christmas Fruit Cakes & Classic Coffee Cake: Coffee Cakes provides Traditional & Classic Coffee Cake, Christmas Fruit Cakes, & Cakes for any special occasion. Want to order Fruit Cakes? 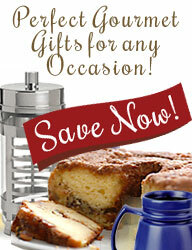 Contact Coffee Cakes when you need Christmas Fruit Cakes or Traditional & Classic Coffee Cake! Enjoy this Autumn Special, we are celebrating our 22-Year Anniversary all year. Price includes shipping! SNACK PACK - INDIVIDUALLY WRAPPED. If you like fruit cake this is a great way to enjoy it at work or on the go, just throw it in your backpack, briefcase or purse! We have taken slices of our Grandma's Famous Fruit & Nut Cake and conveniently wrapped each piece individually. Each slice contains a combination of ripe fancy cherries, fresh succulent pineapples, golden raisins, crunchy almonds, seedling pecans, English walnuts and just the right amount of bonded American bourbon, imported brandies and rum. Individually sliced, they�re easy to take with you � in the lunchbox, in the briefcase, or for just a little indulgence. This Grandma�s Original Fruit and Nut cake package of 26 slices serves approximately 12 and will keep for at least six months if stored in a cool, dry space or the refrigerator. A great fruit cake for any time of year and an especially good Christmas cake. Our 20 ounce Original Fruit and Nut cake individually wrapped slices are great on-the-go. Our newest addition to our Gourmet Coffee Cakes! We think you are going to love it! Tastes and looks homemade. This all butter sour cream coffee cake is our newest addition to our gourmet coffee cakes! We use real butter, high end cinnamon and sugar to make the rich cinnamon streusel just right, that our customers tell us they love. This cake is made by hand with real butter, sour cream, walnuts, high end cinnamon and sugar, then baked to perfection to make this old fashioned sour cream coffee cake with delicious cinnamon streusel. Warm this cake up slightly and melt some butter on top for a yummy gourmet treat! For best results, chill this hand-made coffee cake before slicing to prevent any crumbling. This 48 oz. (3lb) Handmade Cinnamon Streusel Butter and Sour Cream Coffee Cake serves 12-16 people and comes in a beautiful tin that makes a very thoughtful and delicious gift. This Large Hand Made Cinnamon Streusel Butter and Sour Cream Coffee Cake is shipped to you from our bakery deep in the heart of Texas.